There’s nothing more fun than working with a couple in love. When Peter, a long-time customer, brought Janice into our store, we knew that we were in for a treat. Right away the jokes and stories began to roll and we had so much fun that we forgot we were working. It turns out these lovebirds launched their relationship at a local pole-vaulting competition in Fresno, where they connected over a shared interest in athletics. However, it seems they were interested in more than athletics. Peter the artist and Janice the accountant complimented each other just right. Their playful romance took a more serious turn when Peter took Janice on a trip with him to Italy. As if he could get any more romantic, Peter proposed to Janice while they were enjoying a dreamlike ride on a gondola! She of course, said yes and they were so excited that they tried to take a picture and almost tipped over the gondola! These two know how to bring the excitement to any occasion! Peter wanted to find a ring for Janice that matched her uniqueness and beauty. This is the part where we come in. Albert had already designed a one-of-a-kind Tahitian pearl ring with diamonds and 14K yellow gold for Janice. This ring sparked an idea for Janice’s engagement ring that Albert just had to run with! Albert worked with the couple to design a beautiful 14K white gold ring with a double halo and round center stone weighing just over 1 carat. Diamonds on each side of the shank further embellish the ring. However, this ring comes with a grand finale that is both genius and extraordinary! Albert created 14K yellow gold ring guards with intricate diamonds that fit perfectly with both the pearl ring and the engagement ring. This way Janice can create the wow factor with either ring. The two-toned effect really accentuates her engagement ring and takes it to another level. Janice was so pleased with her ring she had Albert make a custom wedding band for Peter complete with 14K white and yellow gold, diamonds, and a filigree design. In the end everyone was ecstatic. It’s not just about the ring, it’s about creating a piece of art that captures the person it’s created for. 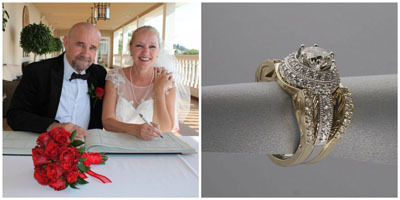 We are honored to have been able to create designs for such a wonderful couple. Cheers to Peter and Janice!